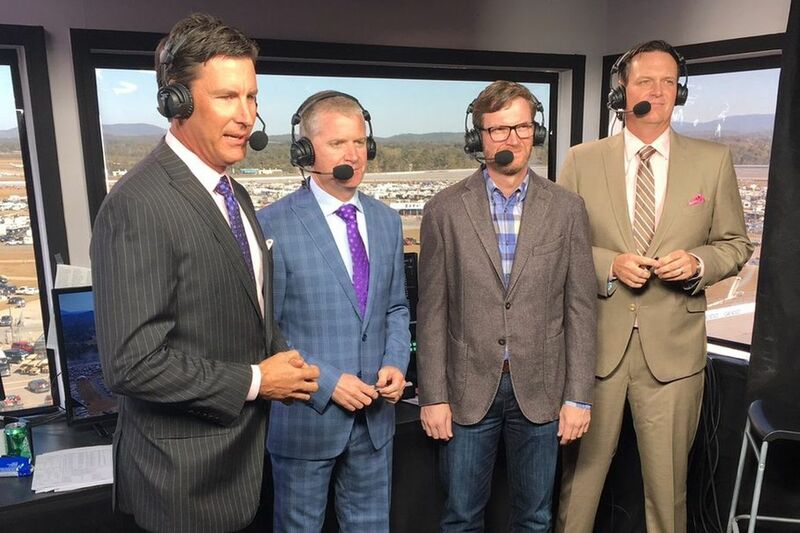 NASCAR on NBC crew members (from left) Steve Letarte, Jeff Burton, Dale Earnhardt Jr. and Rick Allen. DOVER, Del. – NASCAR on NBC analyst Steve Letarte said it does not matter which of the sports it is because they all have one thing in common. "I'm a huge sports fan, and there is nothing better than the playoffs," said Letarte, a long-time former NASCAR pit-crew chief who is in his fourth year of calling races for NBC. "It doesn't matter if it the Yankees-Red Sox. It doesn't matter if it is the Patriots in the postseason. "The Fed Ex Cup in golf or the Stanley Cup in hockey, there's nothing like it. The regular seasons are fun, but there is nothing in the world for sports fans like the playoffs. "Careers are made in the playoffs. Hall of Famers are created in the playoffs. NASCAR is no different. There is nothing like watching guys racing to keep their season successful." The NASCAR playoff system is unique in that, while it starts with 16 drivers qualified to race for the title, each race still features a full field of drivers. Add the fact that four drivers are eliminated every three races until there are just four remaining for a one-race, best-finisher-takes-the-title competition to end the season, and new levels of intrigue are added to each race. It is the job of Letarte, analyst Rick Allen and former Cup Series drivers Jeff Burton and Dale Earnhardt Jr. to present the race and the race within each race to the television audience. They take that responsibility seriously. "Before a race, we look at all of the different story lines that could potentially come up," said Allen, who has been the lead announcer for NASCAR Cup and Xfinity series races on NBC since 2015. "We try to have a game plan for those." In the NASCAR playoffs, the race to accumulate playoff points can become as important as the race to chase an individual checkered flag. Those dual story lines become even more pronounced in an "elimination race" such as the one at the Charlotte "Roval" two weeks ago. Four drivers were going home from the playoffs, but there was also a race to win that week's trophy. There was also the idea that if any playoff driver won, that meant automatic qualification to the second stage that started last Sunday at Dover International Speedway. All mattered, and all had to be covered with equal spirit and intensity. "That all has to be accounted for, but anytime you're doing a live event, you just have to roll with what is presented to you," Allen said. "You have to be ready for whatever comes up." Like at Dover, when a crash late in the race allowed Chase Elliott to win in overtime and move out of the cut zone automatically into the Round of 8. The ability to dissect things that happen suddenly and almost instantly discuss the ramifications is becoming a specialty of the four-man announcing crew. "You see the value of having multiple guys in the booths," Letarte said. "It allows us to adjust to those occasions when just two guys might not be able to address all of it. "I'm not sure I have the brainpower to watch the race and the race inside the race on my own. All of us check ourselves mentally to make sure we aren't as a crew missing anything during the race. "It's important that we let the people at home understand how big the stakes are every time these drivers get on the track." Up next: 1000Bulbs 500 at Talladega Superspeedway, Sunday, 2 p.m. TV: NBC; streaming on NBCSports.